Every story has to start somewhere, and the journey of Ranma and his colorful cast begins here, with Takahashi setting up the premise in the same way a television show might begin with a pilot. We actually begin with a rather pedestrian setup, as we meet the family Ranma is to be married into first, the Tendos. They eagerly await Ranma and his father, who of course show up in changed form, setting the pace for the insanity which is to come. In this first set of chapters, we learn the premise of the comedy (Ranma and his father both change when splashed with hot or cold water, after an unfortunate battle in a set of cursed springs), the dynamics of Takahashi's patented love-hate relationship between Ranma and his reluctant fiance Akane (stuck as the bride-to-be in a great set piece), and the fact that even the "normal" people in this world are anything but your run of the mill extras and supporting characters. 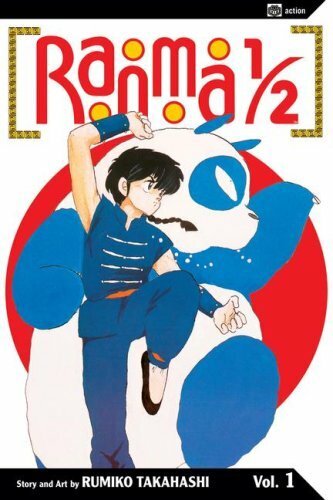 Given how long-running Ranma 1/2 is, it's almost a bit stunning just how much is set up in the first volume. The Tendos learn of Ranma's secret in what almost certainly would be teased out now, the idea that Ranma and Akane just might actually like each other is shown almost from the beginning, and we already get a big battle from a soon to be recurring character. Re-reading this one after a few years away from the series, I was shocked by the level of action and movement here in volume one. Takahashi doesn't waste any time getting the comedy and action going. In fact, that high volume of activity is what drew me to this series in the first place. By the end of this first volume, you know the whole premise of the series, and whether or not you're going to like it. Ranma 1/2's status is not something that's going to take you several books to find out. You'll either fall in love with the mix of pratfalls, verbal and sight gags, and complete absurdity of the premise or you'll be moving on. I wish more manga worked that way. It's definitely one of Takahashi's main strengths. I mentioned above that this is a re-read for me. As a matter of fact, I think I've read this volume at least three times now, plus a few viewings of the anime with different sets of people. I was a bit worried that familiarity would lead to contempt, but instead, it's like returning to an old friend. So far, this series has a high level of readability for me, with the jokes just as well timed as they were the first few times. My manga taste has definitely matured since 2003 or so, and I'm a lot picker than I was back then, when I'd still read things like the Ragnarok series and find them appealing enough to keep going after a few volumes. Ranma 1/2 definitely can take its place as a perennial favorite that I'll want to return to many times. In the introduction to this year-long feature, I likened Takahashi's work t Looney Tunes, and there's definitely a lot of that going on here in the early pages. Ranma and others are definitely talking to the 4th wall from time to time, and the idea that the extraordinary, such as Akane's daily battles to get to school, are accepted without question. We're living in a cartoon world here that only just pretends to be real life, unlike a lot of the other shonen titles I've read. That allows Takahashi to go out on any limb she likes, something that starts here with an iron umbrella and only progresses over time as the series goes on. Though there's certainly a lot of physical comedy, Takahashi's verbal timing is also spot on. Ranma's recurring "Sorry about this" at the beginning is a great running gag (of which there will be plenty later), and the interplay between all of the characters sings to the reader with the craft of someone who is working hard to make it all flow naturally, no matter how outrageous things gets. Pairing banter with funny images, such as characters walking at odd angles or just talking straight-faced to a panda, makes things that much more cool. Reading Ranma 1/2 is a pure pleasure, whether it's your first time or your fifth. If you've never had the chance to try the book, I strongly encourage you to do so. It's a great mix of comedy and action (with just a touch of schoolboy romance), and I'll have more to say about that next time as we move a little further into the series.